The Legend of Korra wasn't so much subversive as it was respectful of its younger viewers. The Legend of Korra reached its series finale last month, bringing an end to the universe that started with Avatar: The Last Airbender. From the beginning, Korra differentiated itself from Avatar with an older cast, a drastically different personality for its Avatar, and a world transformed by ATLA's heroes. Most significantly, LoK spoke to its viewers, young and old, with a more mature voice as it handled issues often reserved for older audiences. While the episodes were never designed to "make a statement", Bryan and I always strove to treat the more difficult subject matter with the respect and gravity it deserved. Most of Korra's fans appear to be young adults (thanks to forums and Tumblr), but there were still plenty of children and younger teens watching the series through its conclusion. Legend of Korra didn't approach the more serious content with an agenda of subversion - rather, DiMartino and Bryan Konietzko (the other co-creator; collectively they're called Bryke) respected those younger viewers and their ability to process the show's more mature stories. Refusal to approach mature subject matter not only puts restrictions on the storytelling process, it sanitizes the final product. After all, kids already know death, depression, and terrorism exist, so why can't their shows speak openly on these ideas? 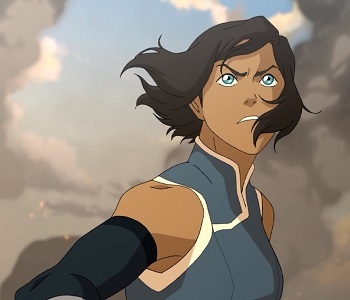 Thankfully, the people behind Legend of Korra acknowledged that younger viewers can handle this kind of subject matter and the narrative was spun with more freedom than many Nickelodeon cartoons, or even Avatar. If you haven't, check out our review of the finale or peruse our reviews of the third and fourth seasons. Spoiler Warning: Nothing is safe beyond this point.